You MUST complete the application, pay, e-sign and select COMPLETE prior to the ATA Office can receive and process this application. Fill out each screen as completely as possible. You are responsible for the accuracy of your submitted application. Please note that registration is 50% less expensive if you are an ATA member. Visit our membership site prior to completing this application - there are MANY benefits to being an ATA member. The ATA registry has four books: The Official Registry Book ( ORB), the Official Appendix Book (OAB), the Official Stud Book (OSB) and the Preliminary Stud Book (PSB). The Official Registry Book (ORB) registers the offspring of approved Trakehner stallions and qualifying offspring of ATA approved Thoroughbred, Arabian and Shagya stallions. There are 4 divisions of the ORB. 1. ORB-A / ORB-E is the Purebred Trakehner division with both parents in the ATA stud book (OSB). The “A” denotes horses born in North America. and “E” designates purebred horses born elsewhere and originally registered with an approved Trakehner organization. Fillies and colts registered in the ORB-A (E) can apply for inspection to the OSB. 2. ORB-B is the Anglo Trakehner division. The sire is always an approved Trakehner stallion (OSB) and the dam is a registered Jockey Club (JC) mare or an ORB-B registered Anglo Trakehner mare. Fillies out of mares, not in the PSB, may apply for inspection to the PSB. Fillies and colts out of PSB dams (either JC Thoroughbred or ORB-B registered Anglo-Trakehner mares) may apply for inspection to the OSB. 3. ORB-C is the Arab-Trakehner division. The sire is always an approved Trakehner stallion and the dam is a registered Arabian, an Anglo-Arab, a Shagya or an ORB-C registered Arab-Trakehner mare. Fillies out of mares that are not in the PSB, may apply for inspection to the PSB. Colts and fillies out of PSB dams (includes Arabian, Anglo-Arabian, Shagya, or ORB-C registered Arab-Trakehner mares) may apply for inspection to the OSB. 4. ORB-D is the part Trakehner division. The sire is always an approved Trakehner stallion and dam can have any pedigree that does not qualify for one of the other divisions or books. Fillies and colts registered in Division D are not eligible for the PSB or OSB. The Official Appendix book (OAB) registers horses with at least 50% Trakehner blood that are not eligible for ORB registration. There are 5 divisions in the OAB. 1. OAB-A horses have an OSB sire and a dam that is registered in ORB-A(E) . The dam has not been inspected for the OSB, but is eligible for inspection. Fillies in this registry may apply for OSB inspection. 2. OAB-B horses have a JC registered sire (not inspected or approved for the ATA stud book) and the dam is an OSB mare. Fillies may apply for PSB inspection . 3. OAB-C horses have a registered Arabian, Anglo-Arabian or Shagya sire (not inspected or approved for the ATA stud book) and the dam is an OSB mare. Fillies may apply for PSB inspection. 4. 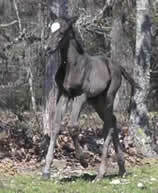 OAB-D horses do not qualify for registration in any other ATA book or division and have at least 50% Trakehner blood. The sire and dam can have any combination of Trakehner bloodlines as long as the pedigree is 50% Trakehner. Offspring of all non-approved ORB-A (E) Trakehner stallions are always registered in OAB-D. Neither colts nor fillies registered in OAB-D are eligible for OSB or PSB. 5. OAB-E horses are imported, registered in the German Stutbuch or Stutbuch 11 (not Haupstutbuch), and do not qualify for the ORB. The ATA bylaws outline complete requirements of this division of the OAB. The Official Stud Book (OSB) has two divisions: OSB-A is for horses foaled in North America and OSB-E is for horses foaled elsewhere, and originally registered with an approved Trakehner organization. 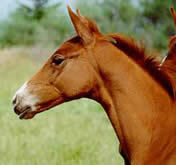 All horses in the OSB have been inspected and accepted for breeding. Colts may apply to the OSB at age 2 or older. Fillies may apply to the OSB at age 3 or older. The sire is always an approved Trakehner stallion with ATA or a daughter organization OR an ATA approved Thoroughbred, Arabian, or Shagya stallion inspected and accepted for the OSB (see complete ATA bylaws to see restrictions on breeding to approved blood stallions). The dam is an OSB mare or an approved PSB mare. The Preliminary Stud Book (PSB) includes inspected and accepted Thoroughbred (JC) mares, registered Arabian, Shagya, and Anglo-Arab mares, ORB-B registered Anglo-Trakehner mares and ORB-C registered Arab-Trakehner mares. Fillies and mares may apply for PSB inspection at age 3 or older. Colts and fillies out of PSB mares by approved Trakehner stallions, may be apply for OSB inspection. The ATA website has complete bylaws that supply all the details of registration. The ATA web site also has a FAQs section that answers many registration procedure questions. A registration application can be created online or if necessary, downloaded from the ATA web site. All Trakehner horses registered with NATA numbers, which begin with GRB, are fully registered with the ATA. Contact the ATA office to determine their corresponding ATA book and division.